You don’t have to go to Cathedral Grove to see giant trees. 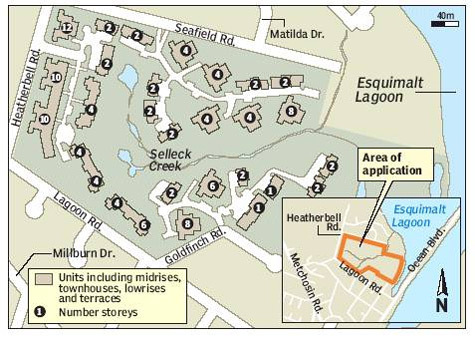 This land above Esquimalt Lagoon contains trees that are among the top 10 biggest Douglas fir trees in the province. One of the firs, dubbed the “Magna Carta Tree”, dates back to the era of Runnymede. It was already several hundred years old when an enormous earthquake hit Vancouver Island in 1700. Three hundred years later, you can see where the very top of the tree snapped off – but the tree is still thriving, and now measures almost two metres in diameter. The land also contains hemlock, cedar, Garry oak woodlands and arbutus -- as well as the most easterly grove of Sitka spruce on Vancouver Island. It also possesses wetlands, interesting geological features from the Ice Age, and aboriginal cultural sites. 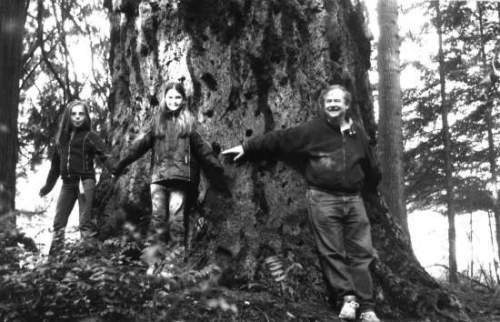 Laura Tobber, Nicole Sandborn and Calvin Sandborn are wrapped around one of the giant Douglas fir trees dubbed the "Magna carta Tree" on land around the Esquimalt Lagoon. 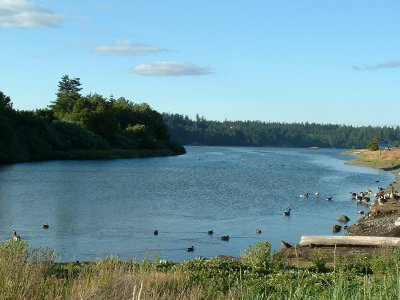 A saltwater lagoon located at the base of the Royal Roads property, next to the Fort Rodd Hill / Fisgard Lighthouse National Historic Sites and a view across Esquimalt Harbour at Dockyard. 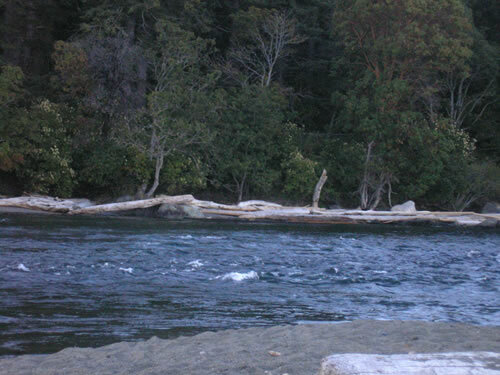 Depending upon the tide there will be one island, and none to several small gravel bars, on the lagoon side of the bridge. These are regular lounging spots for gulls and should also be carefully scoped out for shorebirds. Mew Gulls and Glaucous-winged Gulls are frequent loungers but check the flocks carefully because birders have reported Heermann's, Bonaparte's, Ring-billed, California and even Western Gulls from this site. 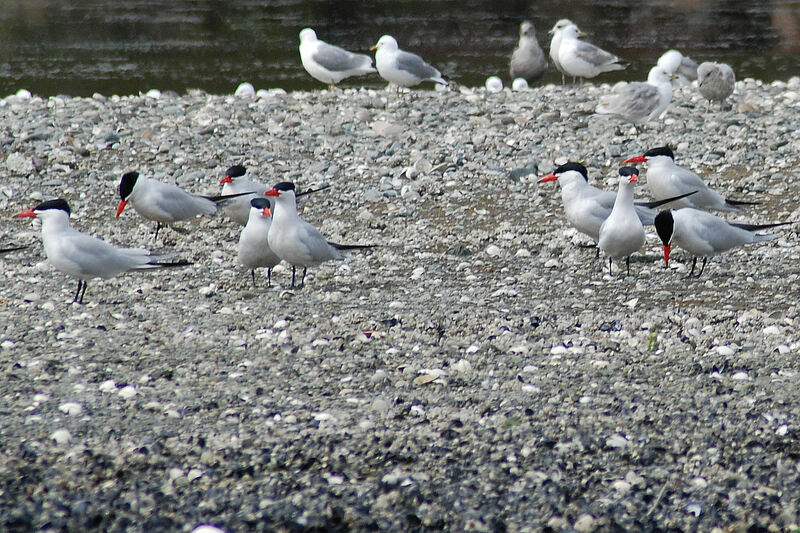 In the Spring watch for large orange bills and dark heads as small flocks of Caspian Terns may also rest on the bars. Shorebirds in season include Black Oystercatcher, Black-bellied Plover, Western and Least Sandpiper, Dunlin, Black and (rarely) Ruddy Turnstone, Sanderling, dowitcher, Semi-palmated Plover, yellowlegs, and Killdeer. Northwestern Crows and Glaucous-winged Gulls will be prowling around looking for shellfish which they will pick up and drop from a height in order to crack the shells. Avian disputes can occur regarding the ownership of the seafood lunch. Waterfowl may lounge on the island or bars or may be found swimming in close proximity to the bridge as this is one popular site for people to "feed the ducks". Red-breasted Mergansers and sometimes Common Mergansers may be seen snorkeling along the far shore or surfing down the stream after small fish. Hooded Mergansers, Mallards, Northern Pintail, scaup, Bufflehead, Barrow's and Common Goldeneye, American Wigeon (watch also for an Eurasian Wigeon), Green-winged Teal, Canvasback, Pied-billed Grebe, Canada Geese, feral Mute Swans, American Coot and Double-crested Cormorants are all possibilities near this end of the Lagoon. Unfortunately, there is also a flock of feral Greylag Geese which have taken over the island. These are "dumped" geese and are not countable, just a nuisance. 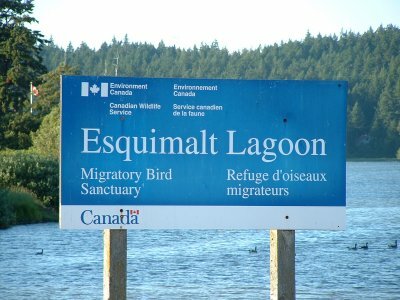 However, there have been Snow Geese seen at the Lagoon and a number of Brant stop over on their way to the Brant Festival in Parksville. Do not forget to look up too. You may sight a Belted Kingfisher sitting quietly on a branch and, either stalking the shorelines or perched high in the evergreens, you may see a number of Great Blue Herons. Watch also for Bald Eagles resting near the treetops, Turkey Vultures soaring over, Common Ravens flapping by or the sudden burst of a Cooper's Hawk. Listen for American Robins, Northern Flicker, Steller's Jay and the "Chicago" of a California Quail. If you turn away from the lagoon you will usually find Rock Doves near the bridge and probably a few European Starlings, House Sparrows and Brewer's Blackbirds checking the roadside for edible bits. Once you have given this end of the lagoon a good going over then you must make your first decision -- how to bird the rest of the spit (known also as Coberg Peninsula)? 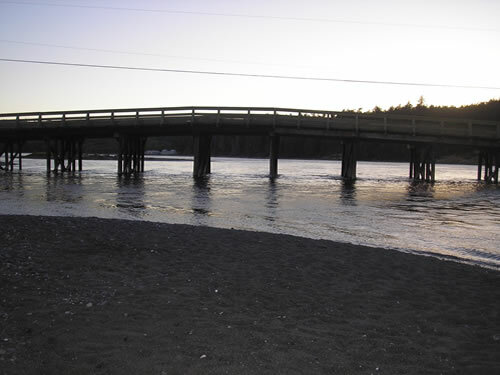 We usually park our vehicle near the bridge and bird along the lagoon side of the spit as we walk westward, then bird the Strait side on our way back to the vehicle. The spit is 2 km long. On the lagoon side there is a narrow gravelly shoreline with small areas of low grass plus a sprinkling of shrubby broom and wild rose. The grasses and shrubs hold, in season, Savannah Sparrow, Song Sparrow, White-crowned and Golden-crowned Sparrow, Brewer's Blackbird, House Sparrow, House Finch, Purple Finch, and American Goldfinch. Peeps and plovers can often be found along the shorelines. In 1996 a visiting birder was fortunate to discover a Mongolian Plover along this stretch. It stayed for a couple of days resting and foraging alongside Semi-palmated Plovers. Look out to the rocky island in the middle of the lagoon because Double-crested Cormorant frequently roost and dry their wings on that island. Check closely. Shorebirds may also be found resting or foraging among the crevices on the island. In addition to the waterfowl already noted scan the lagoon for Surf Scoter, Common Loon, Ruddy Duck and Red-necked Grebe. From late spring to early fall scan the taller trees along the lagoon for an Osprey or two as they seem to be regular visitors. Scan the grassy lawns across the lagoon for Canada Geese, Great Blue Heron, and yellowlegs or other shorebirds since that area provides the birds some respite away from the walkers, dogs and traffic along the spit. The elegant looking building up from the boathouse is called Hatley Castle and is part of the now, Royal Roads University.